Inspired by her home located at the foothills of the Catskill mountains in upstate New York, artist Teri Stratford captures the natural beauty of her environment by creating works of art from hand-picked botanicals. 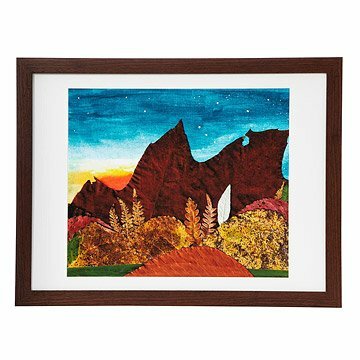 This mountain vista is created from colorful oak leaves gathered from local gardens. As the sun sets in the background it reveals the Three Sisters constellation, an homage the artist dedicated to her own siblings. As the leaves are biodegradable and will fade and deteriorate over time, each of Teri's leaf "paintings" is scanned or photographed immediately after its creation, preserving its beauty long after the originals are gone. Printed in Portland, Oregon.